I realized several weeks ago that “Extreme Weight Loss” was well into a new season and I’d been missing it (thanks to changing cable/internet/phone providers – the new DVR wasn’t set up to record it! We’ve since rectified that oversight). This has actually turned out to be beneficial – now, even when I’ve already watched this week’s episode, there are still plenty of episodes I can catch up on via On Demand when I’m feeling the need for inspiration. But before I share about the episode I watched last night, a couple of thoughts on this season – I LOVE seeing Chris Powell’s wife Heidi taking a much bigger role in the show, and how some of the clients are primarily HER clients with Chris in the supporting role she usually occupies. I’ve also been pleasantly surprised that for the first time I can remember, everyone hasn’t started out in the 4-500 lb range. The last two shows we caught on the DVR were about women whose beginning weights were around where I was at MY highest weight (260 lbs). The change isn’t quite as dramatic (though it’s still pretty dramatic in MY eyes), but they are a lot more relatable for me. I was a little disappointed that those last two shows were only an hour though – I hope it’s due to programming issues regarding other shows on the network, and not an actual format change. I didn’t like when they shortened The Biggest Loser either, because it felt rushed and like you never really got to know the contestants that well (I almost didn’t watch the last season for that very reason, but they got smart and the first few weeks were 2 hours long…they shortened it afterwards, but we’d already gotten to know everybody so it wasn’t as bad). So last night, instead of watching the most recent (one hour) episode, I decided to poke around and check out an episode on demand, which turned out to be a seriously good move. Pearls (aka Tiffany, but everybody calls her “Pearls”) was closer to 300 lbs than I ever got, but there were so many ways I was able to connect with her story. Especially the part about the step-son she lost contact with after a messy divorce (she’d raised him since he was 2 and loved him hard…boy did that hit home). She also reminded me a lot of my next door neighbor (both in her fierce dedication to her son and a little because of physical resemblance). AND she’s an autism activist (as her actual job) – go her! Of course I kept my ears open for any buzz-words that might hint at connections with Autism Speaks (DO NOT SUPPORT THAT ORGANIZATION! ), but happily everything ran true to my own beliefs and knowledge in that regard, so I was quite pleased with how they handled things. ual.asp?blog_id=4169848 ) and how much I was aiming to have those kinds of adventures myself. As a side note (which gave even more punch to watching Pearls training on silks), a friend posted a “memory” on Facebook the other day of when she and I and the mate’s best friend did the Warrior Dash in Ohio. That was four years ago (!) last week. So there I was, watching Pearls fly to Disney World (!) and walk into the Cirque du Soleil building (!! I’ve been there!! My sister and I scored free tickets when we were there to do the Disney Half Marathon in January of 2004!!!) and I just started sobbing. Remembering all my dreams, all the adventures I’d thought I’d have had by now, all the things I wanted to do that flew out the window as my weight crept up semester after semester. No, the pictures don’t do it justice. Go watch (it’s well worth the 4 minutes, I promise)! It’s got me dreaming again. I want to do that!! I want to do another Warrior Dash, and another half marathon (and who knows, maybe I’ll be crazy enough to try another full one of these days)! I want to zip line and try the trapeze (every time I drive to work I pass the Cincinnati Trapeze School’s set up at Burnett Woods and wonder if I could do it, with my fear of heights)! I want to do crazy adventurous things that I can only dream about at this weight! THERE is my motivation – it’s not just the health (tho’ that’s important), it’s not just wanting to be a good example for my patients and my kids, it’s not just wanting to be there for my grandson…it’s about making life an ADVENTURE! I want that again! I feel like someone flipped a light switch in my brain, and I’m seeing the sun again! I remember what inspired me before, and it’s inspiring me again! I CAN DO THIS!! Such an inspiring blog! I watched the clip of Pearl, and it made me cry - so beautiful, to see someone living her dreams that way! Go, you! I think I was cheering you on by the time I got to the end. Listen to Cyndi-don't wait for things to be perfect, live your life NOW. So many of us are guilty (raises hand) of waiting until things are just right...and they never are. Do it right now, so there are no regrets later. I am with you. I am doing this because, yeah, I want to be healthier etc., but mostly I am doing it because I want my life back, my body back. I want to be able to do the things I dream of doing. Yes, you can do this! Your post got me to thinking about what inspires me, so thank you. Let's start the baby steps now and make those dreams happen! Oh my friend may you have many, many adventures. Do NOT let your weight determine what you do. If you want to try aerial work and fly then start training now. Not when you are at the perfect weight. Sure you may not be able to do it all, but find out what you need. If you want to do another Warrior Dash, sign up for one (perhaps next spring would be a good target). 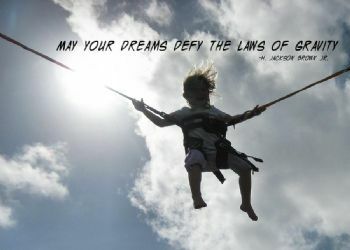 Make your dreams come true and Live your life of Adventure!